VISIT the historic landmark on a tour, open to the public. 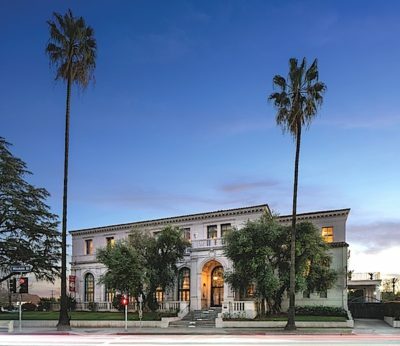 The Ebell of Los Angeles will open its historic doors to the public at a Champagne Open House on Sun., Sept. 24, from 3 to 5 p.m. at 4400 Wilshire Blvd. at Lucerne Blvd. Visitors may tour the Italian Renaissance-style women-owned building, a national, state and city landmark, also designated an Official American Treasure. The guests can join Ebell members in toasting the mission of the Ebell as it celebrates 123 years as a women’s club and 90 years on Wilshire Boulevard. Visitors will also see the architecturally stunning rooms where scenes from productions such as “La La Land,” “Forrest Gump,” ”Mad Men,” “Gilmore Girls” and “American Idol” were shot. They will walk the courtyard garden, the setting for weddings, bar mitzvahs, and a variety of special events. The tour includes one of Los Angeles’ only Broadway-style theatres, which seats 1,270. Vintage fashions from the Ebell closet and artwork by Ebell members will also be on display. The Ebell is dedicated to service, philanthropy and education. The club supports 10 charities serving women and children, and it awards close to 80 college scholarships annually. Attendees will learn about the club’s multiple committees and ways to get involved. The Ebell’s programming line-up features speakers from a wide range of civic and cultural fields. The club’s founding by women in 1894 was inspired by Dr. Adrian Ebell, a professor from Yale, who believed passionately in higher education for women. Event chairs are Rebecca Hutchinson, Linda Dean, Kristan Giordano and Stephanie Striegel. Free parking is available on the club lot on the east side of Lucerne Blvd., just south of Wilshire and directly across from the building. For more information and to reserve, visit ebelloflosangeles.com or call 323-931-1277 x131.